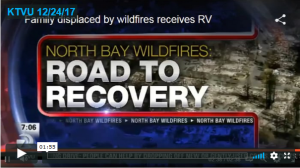 The following white paper was written during our first attempt to do this project for the people of Lake County, California following their massive 2015 wildfires. This is a hastily penned 2015 “white paper” from our founder, winner of an international “Best Security Idea of 2008” award for a rapidly deployable relief sheltering venture. It is based on months studying the strategies and tactics used by disaster relief agencies worldwide, considering technological solutions, and filing multiple patent applications covering sustainable sheltering approaches (since released into the public domain). We hope the information here provides some perspective about the role of RVs in disaster response to all stakeholders involved, including Local, State, and Federal decision makers. Emergency “Response” – This looks like evacuation centers and often tarps & tents. Everything is chaos, and the displaced are in shock and at great risk. The common goal is react as quickly as possible to protect humans from exposure to the elements. Lasts “as short as possible” but generally weeks. Transitional “Recovery” – This looks like anything better than tents. The goal is restoration of stability (utilities up, roads cleared, safe access, schools & businesses reopening, toxics removed from disaster sites, achieving ability to plan the future instead of reacting to immediate events, etc.). In the US, this may involve camps of FEMA trailers, friends doubling up in existing housing, RVs in friends’ driveways, local hotels filling up, and/or moving out of the area (depopulation). Lasts “as short as possible” but generally at least months. From a public policy perspective, reducing depopulation early in the transitional stage is the main goal of this web site. Long-Term “Reconstruction” – This looks like re-building whatever forms of housing the culture preferred pre-disaster. The goal is returning to normalcy, in everything from building code conformance to neighborhood design. In the US, this means replacing lost houses and apartments with new ones, which can require two years or more. This stretches the transitional stage much longer than most government authorities and displaced persons would like. Emergency, Transitional, and Long-Term sheltering require three different solution approaches, three different aid projects, and three different mind-sets. Too often the entire process gets hung up while weather conditions threaten the well-being of disaster victims, e.g., the hurricane season after Haiti or the Chilean winter – or now the impending California winter after the Northern California Fire Storms. The emergency response stage is by nature miserable, but tolerable if short-term. In many instances, it is not short-term because transitional shelters tend to look like long-term installations to fearful decision makers or land owners. Often, land rights, lack of material, utility infrastructure limitations, money, and politics delay transitional shelter until permanent shelter construction can scale. The pre-disaster local planning “not in my neighborhood” mindset often continues long into the transitional stage. And this happens everywhere in the world! It might be human nature. Since any shelter that appears long-term faces so many barriers, the transitional phase often falls short, if measured as “misery is greater for longer than it might have been” rather than numbers of people sheltered. In the developing world, initial tents at evacuation camps are typically replaced with new tents or cardboard as they deteriorate, so there is no meaningful transitional shelter at all and the evacuation camp becomes a refugee camp. This leaves people helpless, fearful, and dependent on “temporary” camp settings for a long time – in some instances, forever. In the US, 100x more dollars per displaced person are available, and top-down decision-making/funding tends to result in large encampments of FEMA trailers or the like during reconstruction. A world apart from cardboard shacks, but they still feel like upscale evacuation centers, with the occupants dependent on government. There is nothing wrong with this and we are not criticizing but observing – it seems the only way large government agencies can possibly solve the problem at scale for large numbers of people. In that respect FEMA’s approach beats any alternative known to man (or woman). American disaster victims quickly receive better shelter than 2/3 of the world has when there is no disaster. But times change, technologies change, new ways of doing things emerge, and if they are useful they grow. Today we have entered a “sharing economy”, characterized by AirBnB (shelter) and Uber (mobility). The former “disrupted” the hotel industry, while the latter “disrupted” the taxi industry. RVs Without Borders is a sharing economy crowdsourcing EXPERIMENT to explore a similarly disruptive approach to transitional sheltering following disasters – instead of FEMA camps, we envision transitional housing to be one borrowed RV at a time, matched with one family, parked in the driveway of a relative, neighbor, or friend, and plugged into an existing electric outlet, hose bib, and plumbing clean-out. The goal is to complement FEMA’s top-down centralized camp/support approach with a bottom-up, grass roots alternative focused on providing greater self-sufficiency to one family at a time, and greater resiliency to the entire community if many people participate. With 18,000,000 private RVs registered in the US, even 1% participation long-term would make crowdsourcing a significant solution vector. This experiment aims to test that hypothesis. 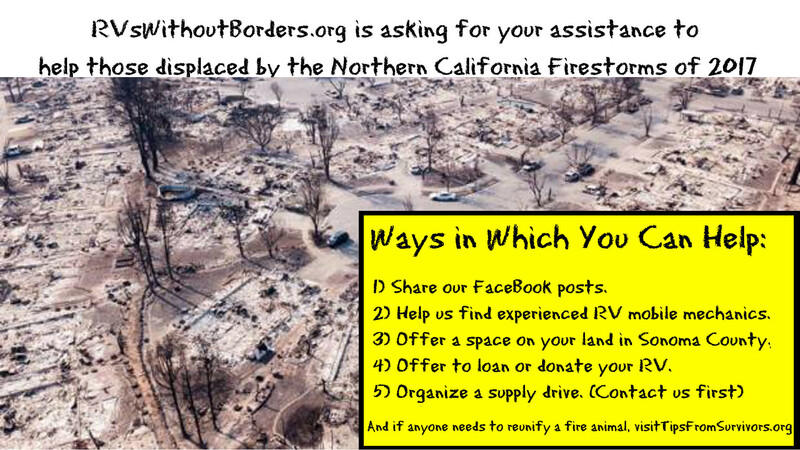 By connecting RV owners directly with individuals in need who then find locations for their transitional shelter within their community, we hope to enable more disaster victims to transition among friends and family in familiar surroundings, instead of in institutional camps or geographically dispersed. We envision RV use beginning in a friend’s driveway, and transitioning to the RV user’s burned property after toxics are cleared to support reconstruction.